One of the things that separates music, such as you’re learning to play on a banjo, from random noise is that time is organized (in some way) within a piece of music. For now, the word rhythm refers collectively to all the different aspects of music that have to do with time and duration. The most important aspect of playing the banjo well — both as a beginner and as an advanced player — is to play with good rhythm. Although your biggest worry at first may be about fretting chords and hitting the right strings, you eventually want to put a lot of effort into playing a song all the way through in a steady rhythm without stopping — no matter what! Playing without stopping is especially important when playing music with others or playing along with the audio tracks that accompany this book. If you start to work on this skill right now at the earliest stages of your playing, you can soon be comfortable playing songs with others, even as a beginner. Rhythm is something that everyone is born with — it’s in the steady pulse of your heartbeat and in the measured cadence of your steps as you walk. If you can keep a steady beat or pulse by tapping your foot or clapping your hands, you’ve got rhythm. You can apply that natural sense of rhythm to playing songs on the banjo. On the other hand, finding the rhythm in music may not be natural for everyone. If you struggle finding the rhythm of a song, you can break down the elements of rhythm, and you can practice to keep pace with any song. Get started by learning a few key terms you need to know. However, Pete Seeger once wrote he’s willing to learn just enough formal music to get by as long as it doesn’t hurt his banjo playing. You won’t lose any self-respect as a banjo player in the process. The term beat refers to a musical unit of measure. To understand what a beat is, try singing one of your favorite songs and tapping your foot in rhythm to your singing. For example, the song “Will the Circle Be Unbroken” sounds like this (try tapping your foot with each capitalized syllable and tap indication): “WILL the CIR-CLE [tap] BE un-BRO-KEN [tap], BY and BY LORD BY [tap] and BY [tap] [tap].” Each foot tap is a beat. In all the music you play, each beat is equal in duration to every other beat. The idea of playing along with a steady beat is central to good banjo playing. The word tempo refers to how fast you’re tapping (or clapping or playing) that beat. Although classical musicians use a lot of fancy Italian words such as presto and largo to refer to different tempos, banjo players use terminology such as slow, medium fast, fast, real fast, and really, really fast. Most of the time, banjo players actually just start playing at whatever tempo feels right, and everyone else joins in when they’ve grabbed hold of that steady beat. You can organize beats into groups of two, three, or four beats for most banjo music (and if you’re playing Irish music, you sometimes group beats into units of six and even nine beats). Musicians use the word meter to refer to any recurring cycle of beats. A time signature indicates the meter and the kind of count you use for a particular song. The time signature usually appears at the very beginning of a written piece of music and is shown as two numbers positioned one on top of the other (like a fraction without the horizontal line). As you can see, the top number in the time signature indicates the number of beats in a cycle, while the bottom number stands for the kind of note that equals one beat. 4/4 time (spoken “four-four time”) is the meter used most frequently in printed music for bluegrass and old-time banjo music. With this time signature, you have four beats in each cycle and a quarter note equals one beat. A measure (or bar) marks off a single rhythmic cycle. In written music, a measure is indicated by a vertical line that extends through the staff. In banjo tablature, the staff consists of five horizontal lines that represent the five strings of your banjo. The first beat of each measure is called the downbeat. The downbeat of each measure is usually emphasized when counting but isn’t necessarily played louder. The initial downbeat (the first beat of the first full measure of a song) is an important moment when you’re playing with other musicians, because that’s usually the time when the other players join in. When it comes time to change chords in a song, you most often (but not always) move to the new chord on a downbeat of a new measure. Most new players find that the hardest part of strumming along to a song like “She’ll Be Comin’ Round the Mountain” is going from the G to the C chords smoothly without interrupting the right-hand strums. When you run into difficulties at a particular point in any song, try to isolate that problem and practice it over and over again. For example, you can practice moving back and forth between just the G and C chords by creating an exercise where you shift from one chord to the other with each right-hand strum. You aren’t playing the entire song at this point, but you’re working on that “problem” moment in the song, where you have to fret the C chord, by practicing this move over and over again. In the long run, you save a lot of time and energy by focusing on problem areas rather than playing through the entire tune and slowing down at the trouble spots. 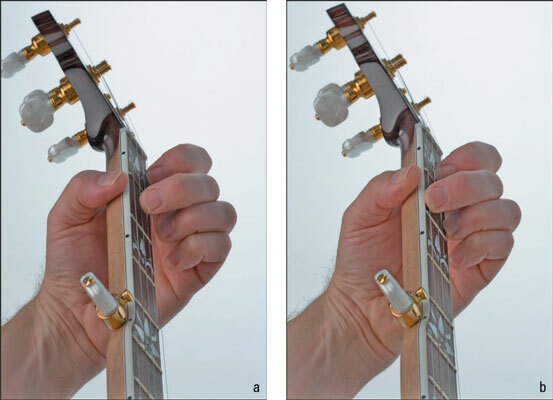 Keep the tips of your left-hand fingers pointed toward the banjo fingerboard even if you aren’t using them at that moment to fret. When playing the G chord, you can position the left-hand fingers you use for the C chord just above their fretted positions, a technique called ghosting. These fingers are then ready to move into position and push down (or fret) the strings behind the appropriate fret (the figure shows how to ghost and fret a chord). Even when you aren’t fretting anything at all in the left hand, it’s still a good idea to keep the tips of your left-hand fingers pointed toward the fingerboard. You can be sure that you’ll need them sooner or later! Ghosting the C chord (a) and fretting the C chord (b).